Keep up to date by spending a couple of minutes every day on my charts. There are fewer charts with more concise information. The first page has a bullet-point list of all the wave counts from super long term to very short term. MY CHARTS – – Bookmark this link. I’ve been very busy and negligent at writing recently and today is a quick note to tell everyone that you really NEED to watch my MY CHARTS on a daily basis. This is my only QUICK and easy way of keeping you up to date. I am playing around with these charts on a daily basis and they are almost always up to date on the wave counts. The chart site has been completely made over. It’s cleaner and fewer charts. I was carried away with the number of charts I had, “were so preoccupied with whether or not they could, they didn’t stop to think if they should”. You now can stay “up to the minute” (at least on a daily basis) on the shortest cycles by reading my notes at the top of the first page. You will find my wave counts from Super long term to very short term. These wave counts are also illustrated on certain charts. These specific charts are noted in the written wave counts explanation at the top of the page. I hope to get a regular letter out soon but I’ve been very busy with other things, research, health issues, etc, etc. Whatever the reason, I haven’t kept you up to date. But don’t forget I would write a few sentences immediately if a turn had been made. There’s only one thing that would stop me from doing that. 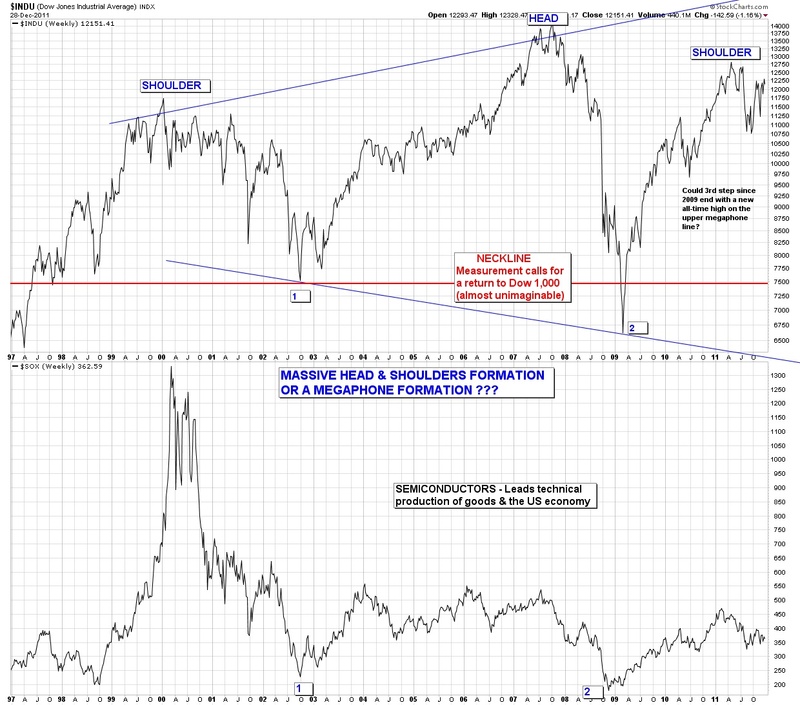 Meanwhile we are getting quite close to a turn that should have a worthwhile correction (see my charts). After this correction we will be free to buy stocks again. If everything works accordingly, we should have an interruption to the 3rd step up that will last at least several weeks (or more). It will be long and deep enough to break the “look” of the rally since the November bottom. This upcoming top will be the end of step 2 up since the October 4, 2011 bottom. Later we should have a 3rd step up that will likely carry us to new all-time highs. This seems like a very very long way from the March 2009 bottom, where thinking about the megaphone formation at that time were the thoughts of a lunatic. During March 2009 I was just hoping that we had a stable bottom. After a few months, thoughts of the megaphone formation were more along the line of “what if???”. I have some interesting ideas for my next letter. One of the ideas is to show some backdated charts of the Hurst cycle. I’m interested in what the Hurst Cycle thought was happening at particular points in time; such as mid and late 2008, early and mid 2009. I want to try and pin down when Hurst cycles began to believe that the March 2009 bottom was a MAJOR cyclic event. I also have a recording from Jeff Saut from last week, which I thought was astute as usual. I thought everyone should hear it. I would like to post some notes on why the 3 steps work. It is a fundamental concept about us as to why 3 steps work. We’re surrounded by the 3s but usually ignore it. Sometime during the period that I was subscribing to Edson Gould, 1973 to 1979, I changed Gould’s method of wave counting to my 3 steps up and 3 steps down theory. It was also during this period that I noted a wave extension where a 3 step could turn into a 5 step (not a 4 step). I got better at calling the waves as time elapsed, which is understandable, practice makes perfect. I think Elliott’s ideas self destruct frequently in today’s markets and their complexity is so extreme that you can manipulate the count to say anything you need. What more can you say about that. I’ll try to get a real issue out late this weekend or perhaps early next week. Jeffrey Saut is a very savvy guy and one of the few people that I follow. The following recording is referencing an email that I wrote a few weeks prior to Jeffrey’s verbal comments on December 6, 2005. I wrote Jeffrey about Bob Farrell and Edson Gould (two of my mentors) and the possibility of a multi-leg bear market similar to 1965-1974. Jeffrey as usual had the near term outlook correct. Jeffrey’s comments were after the 2000 to 2003 crash but 2 years prior to the October 2007 to March 2009 crash. As you can tell from my letter I was thinking of the BIG picture. The book Jeffrey remarks about is highly recommended by me and it’s $10 at Amazon “One Way Pockets”. I have both the print and eBook version. Due to its importance, the following chart is going to become a constant in my blog. Mentioning the “Nifty 50” gives you some idea of the old fart that’s writing this blog. I can make it even worse by asking; Do you remember President Kennedy jawboning the steel industry over their price hike in 1961? There were consequences for those actions as President Kennedy was widely viewed as anti-business after the jawboning incident. Naturally the stock market didn’t like that and since it was already ripe for a correction, it willingly obliged. The market decline began in November 1961 (I think?). But I remember very well the climactic plunge in May 1962 when the Dow Industrials lost 35 points in one day. The Dow average was only 612 at the time and a loss of 35 points was huge. It was a 5.7% one day plunge. I thought the world was going to end as I had never seen anything similar (wait until October 1987). I was a naive kid at the time and now I’m not naive, just an old kid. In addition to keeping track of my blog, I would urge you to check my charts on a daily basis. They will show you the current wave count or newest trend lines. And for the latest update on my thoughts, my charts will always show a change to my outlook before a blog update. I usually draw the trend lines and wave counts on a daily basis. 3 steps must stay confined to a channel. Laying a straight edge on the chart will help you visualize the channel. As the larger trend progresses, all of the steps that make up the trend will also be confined to a larger channel. Sometimes a channel doesn’t become clear until the surge phase (vertical move) has ended and the market settles into a methodical uptrend. When the market breaks its channel (regardless of the perceived wave count), the step has been terminated. This may often be your best indicator that a wave count has been completed. Sometimes ONE of the 3 waves will sub-divide into another 3 waves. I call this an extension. When this happens (1) the trend is still intact, (2) the overall channel will widened and (3) instead of a total of 3 steps, there will be 5 steps. There are always trends within trends from the short term of a few days to the super long term trend that may last centuries. Fitting it together gives you remarkable market perspective. The correction following the second step is normally larger than the correction that followed the first step. Usually I will use the terms “step” and “wave” interchangeably. I frequently think of a step as shorter in duration and a wave as longer term; such as there are 3 steps to a wave. But the steps/waves are all kinda the same as they fit inside one another like a matryoshka or Russian nesting doll. At the conclusion of a 3 (or 5) step move, their will be a counter move. This counter move MUST be of sufficient strength (or duration) to BREAK THE CHANNEL of the prior move. Breaking the channel has the appearance of breaking the “LOOK” of the prior move (channel). If a channel break doesn’t occur after ALL of the counter trend steps have evolved, you have miscounted the steps and the previous trend is not finished. Breaking the channel is a very important concept because this may be the only clue you have that your count was incorrect. After 40 years I still have many of the publications from his advisory service, “Findings & Forecasts”. Fearing the loss of these hard copy reports I have recently scanned and created pdf files of these reports. One of the prime indicators that I use (series #1) was mentioned by Gould only once in his market letters. If you didn’t catch its importance, too bad, because he only gave you a peek. I believe that he used this tool extensively and never told the world it’s importance. Prior to Gould writing about this indicator I had been looking for one that had similar characteristics without success. Thus when Gould wrote about it, I recognized instantly that I had struck gold. I have modified this indicator slightly and researched it back to 1939 for the Industrials, Transportations and Utilities . This was a lot of work as it was before computers and online data (remember when Barrons was available only on paper, still is for the distant past). Edson Gould was truly a legend in his own time. It’s too bad that today many people have forgotten or never heard of him or his discoveries. This is a man that deserves to be remembered throughout technical analysis market history. Below you will find the first page of some of his reports.